Does the draft system promote equality in the NHL? It is hard to ignore the vast amounts of money in modern day sport. Every year, transfer, sponsorship, and wage records get broken worldwide. However, does the growing influence of money in sport create an ever increasing inequality that is yielding sporting and financial advantages to only a small amount of clubs? Away from the glitz and glamour of million pound contracts, the majority of sports clubs can only dream of international superstar players and winning trophies. On the other hand, the major American sports have always been at the forefront at trying to create a system that promotes an equal playing field for all teams, a system that rewards coaching, tactics, and squad management, rather than teams who boast vast wealth. The American sports enforce a wage cap across all teams to stop wealthy teams monopolising the market, and hold a yearly draft system so teams that have performed poorly, are rewarded with the first chances to recruit the best, new talent for the next season. Therefore, in theory, every team should start off on equal terms, with no one team sustaining long periods of success or failure. So is this the case in the NHL over the last 10 years? When looking at the teams who have had the top 5 draft picks since 2006, only on 16 occasions (32%), did that team qualify for the playoffs the following season, compared to 34 times (68%) that teams failed to reach the playoffs the following season. Interestingly, the most recent draft of 2015 has seen none of the teams who had a top 5 pick reach the playoffs in the ongoing 2015/2016 season. 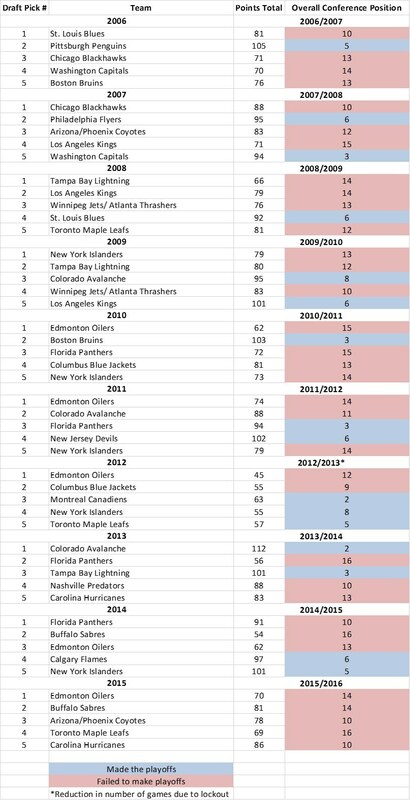 The data since 2006 also shows that the Edmonton Oilers have achieved the #1 draft pick on 4 separate occasions, and have had a top 10 pick 8 times out of the last 10 drafts, yet have never made the playoffs the following year. However, sport is a complex affair and the chances that one draft pick would turn a poor team into a good team overnight are slim. Therefore, it is important to look at the draft as a whole and see how teams have managed all of their choices over a 10 year period. Looking specifically at the average first pick of the draft, there is a significant difference between all of the teams. The Edmonton Oilers first pick averaged at 9.7, where as the Pittsburgh Penguins first pick averaged at 33.5. 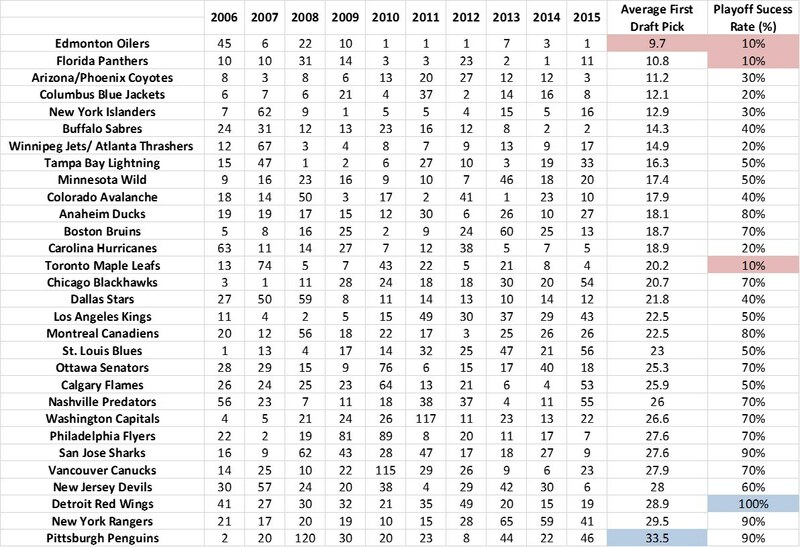 So over the last 10 years, on average, the Oilers have had the best pick of the fresh new talent the NHL has to offer. However, the data shows that this has not produced success. Although the Oilers average the lowest draft picks, they have only achieved making the playoffs 1 out of the last 10 seasons. Whereas, the Penguins, who on average made their picks later on in the draft, have made the playoffs 9 times out of the last 10 seasons. The Detroit Red Wings, who have not missed the playoffs since 1990, also averaged a high first draft pick (28.9) since 2006. So although, the American system should be praised for its pursuit of equality, the data shows that within the NHL since 2006, inequality is still very apparent. Perennial poor performers, the Edmonton Oilers and the Florida Panthers, have been consistently rewarded with early draft picks to strengthen their team, yet have failed to turn their fortunes around on a yearly basis. At the other end of the spectrum, the Pittsburgh Penguins and the Detroit Red Wings, maintain success year after year, all with later draft picks. Is the draft system failing the majority of NHL teams, or is it helping to highlight poor management and recruitment?